Hidden Response Accuracy in the ATmega328P « Adafruit Industries – Makers, hackers, artists, designers and engineers! Some people may have known already about the temperature sensor built into the ATMEGA8, 168, 328 series microcontrollers, but the most serious enthusiast would write off the 1°C resolution as just a coarse sensor of no practical use. I would have to say I was part of that group, until I compared the response between the two sensors. 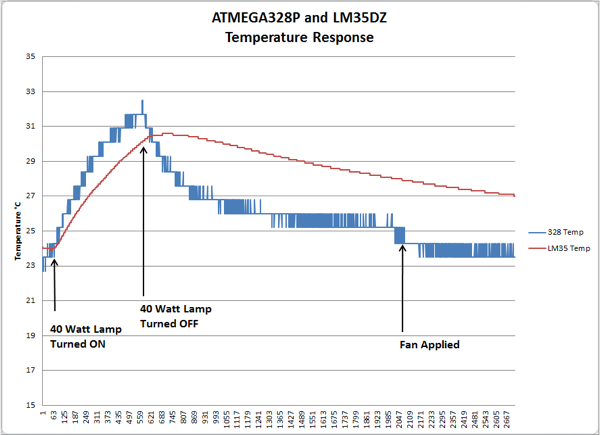 The TI LM35DZ is a simple temperature sensor that has an accuracy of +/-0.5°C at 25°C and with 0.08°C of self heating, this should be sufficient to demonstrate the rough nature of the ATMEGA328′s internal temperature when compared to dedicated external sensor. The TO-92′s have the best Thermal Reponses on the datasheets and are the cheapest. Connection is straight-forward, +5VDC, Vout and Gnd with Vout to the ATMEGA328′s PC0 (Arduino pin A0). For the ATMEGA328 internal sensor, adjustment of the voltage offset can be used to calibrate to another sensor.